Domestic violence is one of the greatest tragedies of society. It breaks my heart that where we should feel the safest — our home — is where too many women and children face fear and abuse. Several years ago, Knitting for Charity featured Handmade Especially for You. This organization provides comfort scarves, hats, and baby items to domestic violence shelters all over California. For many of the women afflicted by domestic violence, these are often the first gifts they’ve ever received. 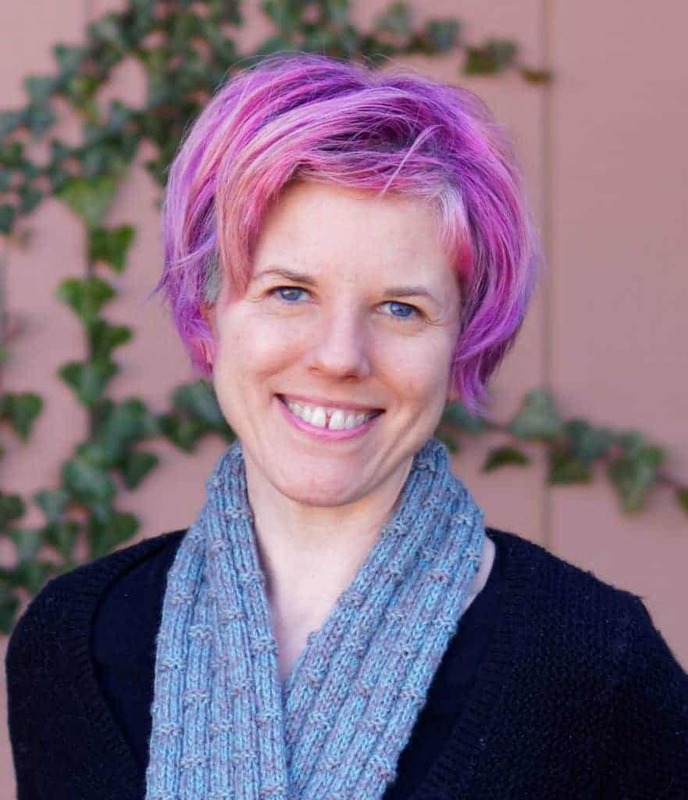 Leslye Borden, the director of Handmade Especially for You, saw the leftover yarn scarf post from a few weeks ago and graciously offered two patterns to readers of Knitting for Charity. These patterns are terrific for using leftover yarn! When was the last time you found a bit of leftover yarn inspiring? I don’t give a lot of thought to leftover yarn. In fact, I usually consider leftover yarn to be more of a bother than anything else. Something about them — their odd shapes, their non-complementary colors, their varying sizes — makes my slightly OCD tendencies twitch. Remember that scarf pattern post I alluded to earlier? Not only is this scarf beautiful, but it will also keep refugees warm in the midst of their desperate situation. I find that inspiring… and I’ll bet you do, too! Perhaps it’s time to stop thinking of leftover yarn as a nuisance and start letting it inspire us. Read on for Leslye’s patterns below and start getting inspired. Women aren’t the only residents of domestic violence shelters; most shelters house children as well. These hats are simple yet adorable. And for children fleeing a violent home, they often mean the world. About 60 yards of (equivalent to) bulky weight (# 6) yarn for 44 stitch hat; about 70 yards of (equivalent to) bulky weight (# 6) yarn for 48 stitch hat. If you do not have # 6 yarn, you can combine lighter weight yarns to make a yarn equivalent to #6. Begin pattern: Knit 2, purl 2 to end. Follow this pattern on every row until your hat measures 8 ¼ inches (44 stitches) or 9 ¼ (48 stitches) inches from the beginning. Last row: knit 2 together, purl 2 together all around (22 stitches remain or 24 stitches remain). Cut yarn, leaving a long tail. To finish: Bring tail through remaining stitches, pull very tightly, and close the top. Weave in the ends. 2. 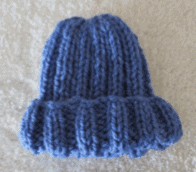 Knit a 4-inch brim of one color and then alternate rows with another color. Finish with the color of the brim. 3. 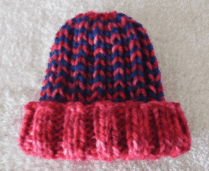 Use scraps in a single- or multi- color range to give the hat interest. Change yarns randomly and not in the same place each time as you knit the hat. 4. Make your own # 6 weight yarn by combining 2 lighter weight yarns and treating them as one yarn. When you finish, please sign the Handmade gift tag with your first name. 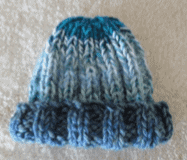 Use a piece of scrap yarn to attach it to your hat. The comfort scarf is at the heart of the Handmade Especially for You mission. Because this scarf is often the first gift a woman fleeing domestic violence has ever received, it is especially meaningful and comforting. This pattern uses many pieces of yarn too short to make into one scarf, but when combined with other pieces, makes a very beautiful scrap scarf. Use your creativity to design your scarf. Arrange pieces of yarn on a table in front of you. You can put them in some order (mix light and dark yarns, alternate textures, etc.) or use them all randomly. 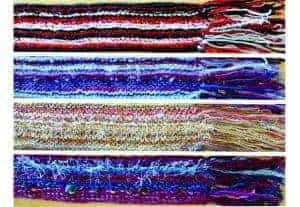 Using the cable-cast-on method, cast-on 150 stitches using the heavier weight yarn and the Size 15 or 17 needles to keep the edge stitches loose. Leave a 7-8 inch tail on both ends to use as fringe. Tie on next yarn to the cast on yarn, leaving a 7-8 inch tail at the beginning. Knit one row and tie this yarn to previous row leaving a 7-8 inch tail at the end. Tie on next yarn to the row just knitted, leaving a 7-8 inch tail. Knit one row and tie this yarn to previous row leaving a 7-8 inch tail at the end. Continue in this manner until you have used all 17 pieces of yarn. Helpful Hint: to avoid confusion, never put your knitting down at the end of a row. Always knit a few stitches on the next row before taking a knitting break. Cast off using the heavier weight yarn and the Size 15 or 17 needles to keep the edge stitches loose. Trim fringe to ~ 6 inches. Thank you so much to Leslye for sharing these patterns with Knitting for Charity readers! I’ll bet you’ll never look at leftover yarn as nuisances again. You’re very welcome, Cindy. Thank you for reading!